A fractured foot can take you out of the game for weeks at a time. Since the bone is fractured, it needs to fuse back together during the healing process for you to gain full mobility once again. It can seem like a long process, especially if you're anxious to start exercising again. Unfortunately, exercising before you're fully healed could aggravate your injury. Heed your doctor's warnings and begin modified, careful exercise only when your symptoms subside. If you've fractured your foot, depending on the severity of your fracture, you may be in for a long recovery time. 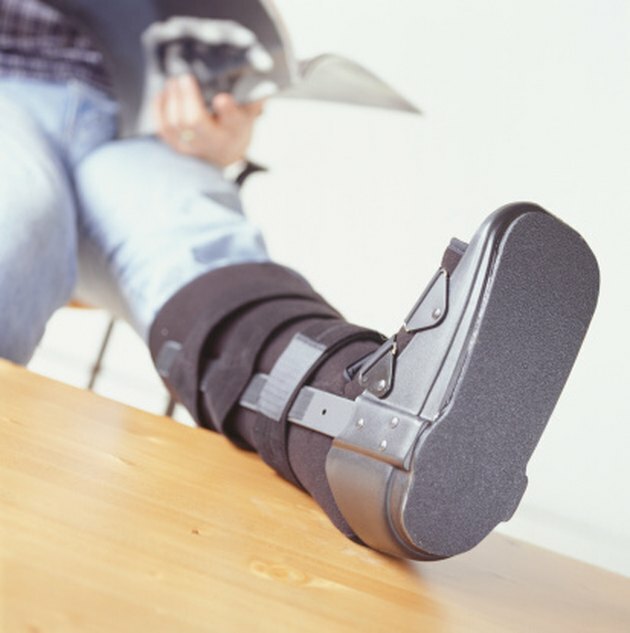 The average foot fracture takes about eight to 12 weeks to heal. While you won't be completely restricted during healing time, it's important that you give your foot full time to heal before doing weight-bearing exercise or playing sports. Aggravating the injury could prolong the healing time. Your doctor will likely suggest range-of-motion exercises to help keep the ankle muscles limber while your foot heals. Physical therapy may be used to help rehabilitate the muscles surrounding your ankle and foot while you are restricted from walking on your foot. Physical therapy may include gentle stretching, resistance activities and assisted walking as your foot begins to heal. Your physical therapist can give more detailed and personalized instructions concerning your daily activities and when you can begin exercising again. It's important that you pay close attention and follow all recommendations for proper healing. For the first six to eight weeks of recovery, your exercise routine may be restricted by the various equipment you're required to use in order to heal. For instance, your doctor may prescribe that you wear a hard-soled shoe to stabilize your foot during the healing process, or you may use crutches to keep weight off your fractured foot. When using therapeutic equipment for healing, you'll need assistance to walk, let alone participate in other fitness activities. Until you've healed, assisted walking will likely be your exercise activity of choice. Besides physical therapy with your therapist and assisted walking with a boot or crutches, you won't have much occasion to exercise until your foot is healed. While the precise healing time will depend on the severity of your fracture, you should be able to put weight on your foot between eight and 12 weeks after the fracture occurred. As you heal, you may be able to add non-weight-bearing fitness activities into your exercise routine, such as water aerobics. Once you're able to begin adding weight to the recovered foot, you'll need to start slowly and condition the muscles in your foot once again to your regular exercise routine.